It used to be that they were the standard. You want attractive? Look to them. They are normal. Everyone else is overweight. But now in a disturbing trend in society, it’s all been flipped on its head. Over the past few years, beauty has been redefined. In a hybrid celebrity-grass roots movement, women have been taking a stand, acknowledging that curves can be beautiful too, and ladies should be comfortable with their bodies. Nothing wrong here. I totally agree. While being confident shouldn’t necessarily mean that one doesn’t want to change (speaking from experience), people, and women who are generally held to a higher standard of appearance and hence are judged accordingly, should be confident in how they look. Curves are not a bad thing, nor is not fitting the mold of society. The new generation of female celebrities seem to be embracing this. Fantastic. Where do we run into a problem? Almost in an affirmative action-esque bitterness, women with curves are lashing out at anyone who doesn’t fit their image. I thought this was about women being confident with their bodies? If the female proportion of society is screaming to accept and love whatever body type one has, so as not to tread on those who are curvier, why are the women who used to fit the mold of attractiveness now being downtrodden? I think I finally came to this realization a couple years ago when I watched Julie Borowski’s video about being naturally skinny and how the counterrevolution attacked her for it, which was about the same time a friend of mine was being called a “skinny b***h”. You can say what you want about me; heck, I’ll probably laugh with you. But my protective nature kicks in when people start to mess with my friends, especially those of the female persuasion. And honestly, it doesn’t really matter who writes this, because the arguments should make or break the point, not the person. But if it is any help, I have never been accused of being thin; even when I was playing soccer regularly I still was large-framed. So this isn’t me being upset over being personally offended; rather, I am defending the people who are being attacked. Anyway, I have no problem with curves being considered beautiful too. As “beauty is in the eye of the beholder”, who cares what the media says anyway? (That really goes for anything, in fact.) But what did skinny girls do to suddenly come under fire for their bodies? What of this utter hypocrisy that screams to curvy women to embrace their bodies while shaming those without a fuller figure? 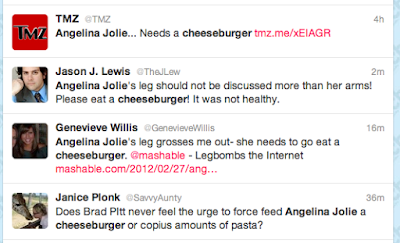 I’m not generalizing all women with curves by any means, but it’s enough of a trend that it warrants mention. Women can’t help their body type. They can usually have control over their weight, but even then they should not be looked down upon. So does it not stand to reason that if a woman can’t help but have curves, a woman also can’t help but be skinnier? Why, in the midst of this counterrevolution, is curviness natural while being slim is seen as unnatural? A woman may work hard, insanely hard, to stay in shape and be physically fit, and she is berated because she doesn’t have as much cellulite. Sure, perhaps back in the day thin women made fun of heavier ones to make themselves feel good. Now, heavier women make fun of thinner women because the in-shape women do what they won’t. Instead of taking inspiration, they take up arms against anyone who looks better. Take the case study of the Victoria’s Secret Fashion Show last year. Now before you go jumping headlong into conclusions, no, I didn’t watch it. I don’t think Christians should be watching it. But I also don’t agree with the alarming backlash received. Many have no issue with the nature of the Show or the advertising of a company like Victoria’s Secret. They’re just jealous. Everywhere you see, “Don’t pay attention to these women, that’s an impossible standard.” Clearly not, because they have met it. Generally something is not “impossible” if it occurs. “They look too thin.” “They look malnourished.” “You need to go eat a cheeseburger.” Women who are disciplined and try to look good are attacked. The women insulting these models could never themselves be models. Instead of at least having the respect for those that work hard to stay there, instead they take up pitchforks and torches to go after those who look better than them. Who are thinner than them. Who stay in shape. Again, I don’t excuse the Victoria’s Secret Fashion Show or things like it. And I know there are women and men who are legitimately underweight. But is this a legitimate concern I’m hearing from these “bold and beautiful” women, or is it envy? I always try to stay a step ahead of mainstream society. When curvier women were seen as unattractive, I was asking, “What’s wrong with them?” Now that the table has turned, I’m asking what is wrong with being slim. 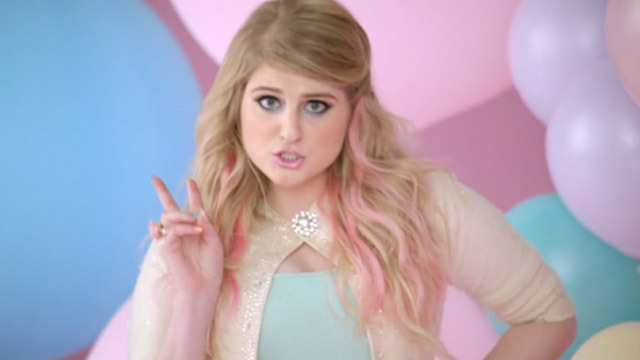 Meghan Trainor in "All About That Bass"
So Trainor wants women not to base their worth on their size, but on their…ability to please men? And she’s so body positive that she lashes out at slender women. That sounds rather insecure, actually. Not a whole lot of punches being pulled there. Plenty of grammar and basic decency, but no punches. And in mainstream society, phrases like “Real men like curves; only dogs go for bones” are certainly encouraging naturally skinny women to love their bodies. “Real women have curves!” You get the picture. 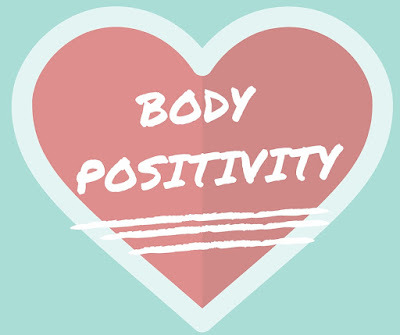 We’re all about that body positivity–unless you’re thinner than me. Attacking someone because they are different to make yourself feel better is immature and cruel, no matter what the circumstance. This is nothing more than schoolgirl games being played by adults who ought to know better by now. It doesn’t matter what size they are. Men will find different qualities attractive. If you are naturally skinny, embrace it. If you are naturally curvy, embrace it. And don’t tell the other that there is something wrong with them because they are different. Used to, it was acceptable to tell a woman she needs to lose weight. We have removed one ridiculous thing and replaced it with another. A thin woman can’t tell a fat one that she needs to lose weight, but the fat one can tell the skinny one that she needs to gain weight. This is a false sense of security bred out of jealousy for women who keep in shape or who are naturally thinner. I’m not at all saying if you don’t work out or aren’t slim you’re unattractive, but the women who do work out and are slim aren’t either. Last time I checked, “celebrating what God gave you” includes all body types, not just the one we’re being told to accept. Get over your egos and practice what you preach.